The rocket ship hurtled at the speed of light through the endless depths of outer space. And within its gleaming silver hull there slumbered a squadron of interplanetary astro-commandos, recumbent in their long, neat rows of suspended-animation pods, dreaming merrily of the Whores of Andromeda. They had traversed the universe, dodging comets and black holes, battling merciless alien hordes in epic laser fights that lit the galactic skies like purple-hued supernovae. And when at last their mission was complete, and the flag of mankind fluttered proudly in the celestial breeze, the captain of the astro-commandos had steered a direct course for Andromeda. Because, as every seasoned spaceman knew, that was where you found the very best whores. Whores covered with long, stinging tentacles. Whores with beaks and flipper-like appendages. 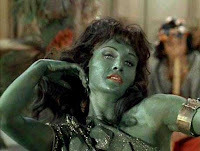 Whores who resembled craggy boulders, or were composed entirely of foul-smelling vapor, or who looked like reptilian Abraham Lincolns, complete with stovepipe hats and phosphorescent erogenous zones. And many, many more. Sure, there were plenty of other prostitutes in the universe. But there was something special about the Whores of Andromeda, some ineffable mystique that could the warm the heart of the loneliest rocketeer. Also, they were very reasonably priced. The spacecraft slowed as it passed the first outlying solar systems of Andromeda. Now the cabin stirred to life with blinking lights and the soft whir of machinery. One by one, the astro-commandos emerged from their pods, yawning and stretching, rubbing the sleep from their eyes. For their first breakfast in weeks they ate Neptunian energy-wafers, washed down with mugs of space-coffee from Alpha Centauri. And then they made their way to the portal windows, where they gazed out at the twinkling heavens, licking their lips in slobbery anticipation. ah, the clap at zero-g. an experience not to be missed in this lifetime. In Andromeda, the clap is known as Xerbleech!